Auction Decorating: Make use of those corners! 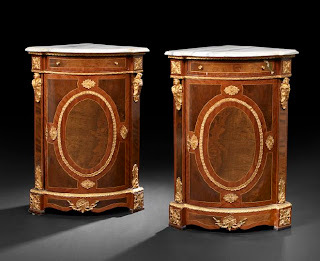 Ideas for decorating your home with furniture and art from auctions. Make use of those corners! Sometimes a corner just looks bare, and other times we may have limited space and need to put corners to good use. There are cupboards and chairs designed just for that purpose! A corner cupboard that hangs on the wall is the ultimate space saver. It take up not room on the floor, and usually looks great too! 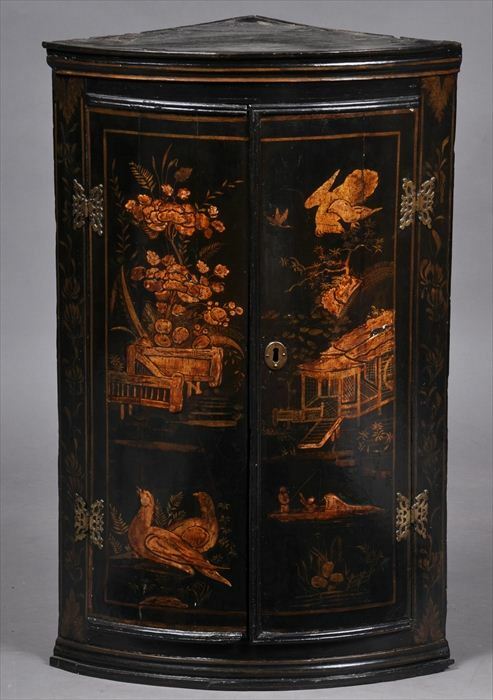 This wonderful chinoiserie decorated cupboard sold a Stair Galleries auction in Hudson, NY recently. 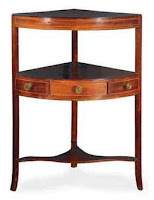 It's described as a George III black japanned bowfront cupboard, and stands 36" tall. It sold for $800 off an auction estimate of $1,200 - $1,800. This example has a more rustic look, and is being offered in the April 9th and 10th auction at New Orleans Auction. 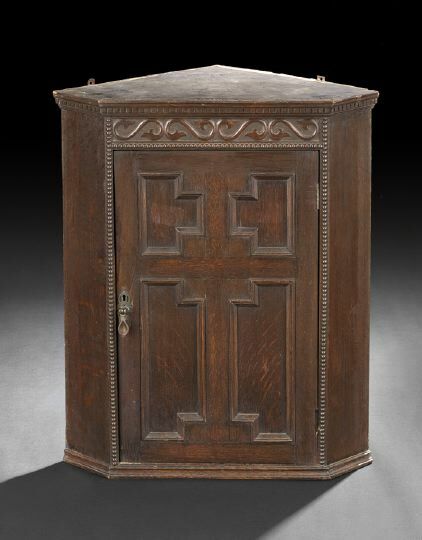 This is lot 58, and is described as an English oak hanging ecclesiastical cupboard, 3rd quarter 19th century. It's 30" tall, and has an auction estimate of $125 - $250. For something that sits on the floor, there are small and large versions. I like this English of American 19th century mahogany washstand that sold at Christie's in New York for only $125 off an auction estimate of $500 - $700. They did note that it had a replaced rear leg. This is just a lovely piece and would look great with a vase with flowers on top to liven up a dull corner. 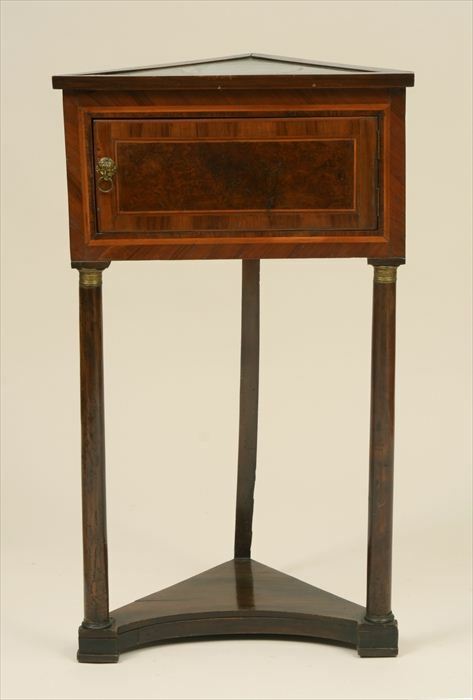 This Continental neoclassical fruitwood and burlwood corner table with a marble top is offered in the next Stair Galleries auction in Hudson, NY on April 1st. It stands 39.5" tall, and has an auction estimate of $700 - $900. It's Lot 42. This is also a very pretty design with nice detail in the wood. This is a much more substantial corner cupboard. Think lots of storage! It's quite decorative as well. This sold at a Christie's auction for $813 off an auction estimate of $1,500 - $2,000. 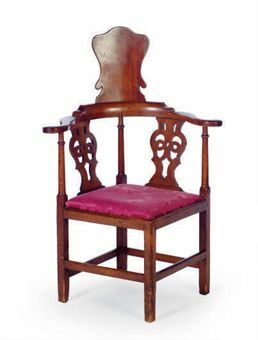 It's described as 19th century English walnut, and stands 86.5" tall. 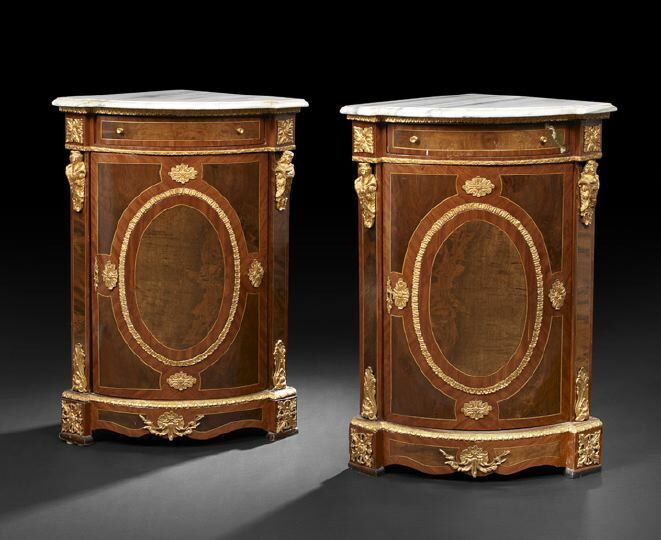 If you have two corners and are looking for a more formal French design, this pair of Napolean III style kingwood, burl and marble top corner tables offer lots of style and storage! These are Lot 1019 in the next New Orleans auction, and have an auction estimate of $1,200 - $1,800. A discussion of corners would not be complete without corner chairs. I found this unusual mahogany George III design a real talking piece. 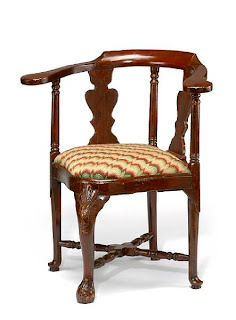 This is 3rd quarter 18th century, and sold at a Cristie's auction for $1,000 off an auction estimate of $500 - $700. The head rest makes this quite special. A corner chair is great because it can be tucked away and brought in to service when that extra chair is needed. Bonhams had this wonderful classic corner chair in a past auction, which sold for $976. It's also a George III, but painted and carved walnut. It's 3rd quarter 18th century. Don't let those corners go to waste. Fill them with a piece of furniture meant for just that space. I've had a passion for decorating for over 20 years. I'm always looking for ways to find the interesting and unusual often at better prices than elsewhere. I believe in mixing the modern with the classic, and never letting one style drive you! Have fun! Time to decorate the garden! The more mirrors the merrier! Asia Week - Opportunities for Auction Decorating! Don't forget the waste basket!